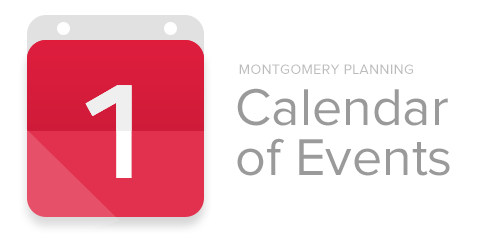 SILVER SPRING, MD – The Montgomery County Planning Board and Planning Department, part of The Maryland-National Capital Park and Planning Commission, are pleased to announce their January 2017 calendar of events. These meetings offer opportunities for the Planning Department staff and Planning Board members to discuss policies and engage with the public. Review the full list of events and ongoing plans and projects below and go online to www.montgomeryplanning.org for more details. January 5 – Attend the first Planning Board meeting of 2017 (8787 Georgia Avenue, Silver Spring, MD). Consult the Board’s online agenda (posted 10 days prior to the meeting date) for details about the session. January 9 – Planners will present their draft recommendations for the White Flint 2 Sector Plan to the City of Rockville Mayor and Council at Rockville City Hall (111 Maryland Ave, Rockville, MD 20850). The Council meeting begins at 7:30 p.m. and is open to the public. January 11 – Learn about the new pedestrian and bicycle infrastructure recommended in the Bethesda Downtown Sector Plan at a public meeting co-sponsored by County Council Vice President Hans Riemer and the Planning Department. This community forum will be held from 7 to 8:30 p.m. in Room D of the Bethesda-Chevy Chase Regional Services Center (4805 Edgemoor Lane, Bethesda, MD). January 12 –The Planning Board will hold a work session for the newly revised Recreation Guidelines and a public hearing for the White Flint 2 Sector Plan. Consult the Board’s online agenda (posted 10 days prior to the meeting date) for details about the session. January 17 – Attend the public meeting for the Grosvenor-Strathmore Metro Area Minor Master Plan from 7 to 9 p.m. at the Music Center at Strathmore (5301 Tuckerman Lane, North Bethesda, MD). RSVP for the event. January 19 – Learn about the updates to the M-NCPPC Park Rules and Regulations at a briefing to the Planning Board. Consult the Board’s online agenda (posted 10 days prior to the meeting date) for details about the session. January 26 – In anticipation of the County Council’s public hearing on the Bethesda Downtown Sector Plan, the Planning Board will discuss a zoning text amendment that would establish the Bethesda Overlay zone, including defined terms, land use standards and procedures for development approvals. Consult the Board’s online agenda (posted 10 days prior to the meeting date) for details about the session.